· Visit the cemetery and leave a message of candy conversation hearts to melt in the snow. · Tie a home-made Valentine to a helium balloon and let it fly away to heaven. · Collect old Valentines and love letters from your husband and put them together in a memory box. · Create a collage of photos. Frame it to hang on a wall or stand on your dresser. 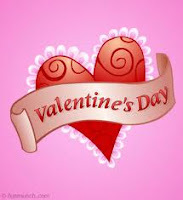 · Buy a package or two of school Valentine cards. Send them to your own children, nieces and nephews or other family members. Write a little love note on them. · Or send Valentines to various groups--nursing homes, children's hospital wards, missionary kids you pray for, your children’s ministry leaders, your ladies Sunday School class or Bible study group, etc . . .
· Offer to babysit for a married couple so they can enjoy a romantic evening out. Prepare a lot of fun things to do with the kids so you don't end up bored and feeling sorry for yourself. · But... (true story) if the church ladies want to recruit you to serve at the Valentine Banquet for all the happy couples? My gut instinct is to just yell "No!" as you give them a good boot in the booty. But the widow this happened to decided she would do it in the power of the Lord, and you know what? She survived and felt stronger for it! So it just depends on what God wants you to do. · Invite other widows over for tea or coffee and snacks, or a carry-in lunch or supper. Give them an opportunity to share their stories and send everyone home with extra meals. · Plan something nice for yourself. What have you always wanted to try? Sign up for Zumba lessons or Jazzercise. Take piano or guitar lessons; or rent a flute or violin and practice to audition for the local orchestra. Ask about singing with your church group or community choir. Volunteer at a food pantry or find a part-time job at an interesting place. Take a course at a community college. . . --hey, I'm getting carried away here, but you get the idea: Plan some fun and show yourself some love and kindness. Do you want to skip it altogether? THAT'S PERFECTLY OK TOO! Sometimes that's the best way to be kind to yourself and it has nothing to do with that over-used and often misapplied word "denial." Don't worry about it. Have you heard other good ideas? Please share them in the comments. Remember that Valentine's Day is a just a commercial day but God's love will never fail you. Valentines Day, the 14th, marks the 9 month date of my husband's passing. I decided that instead of sitting home and being sad I would grab my bestie (who is divorced) and we are going out to an area restaurant and having their terrific "Valentine's Day Special Dinner" of steak and lobster.